Once again, I find three-packs to be the bane of my existence. They usually consist of one figure I desperately want, one that’s okay but one that I’d likely pass on if it were sold individually, and one that I have absolutely no interest whatsoever. 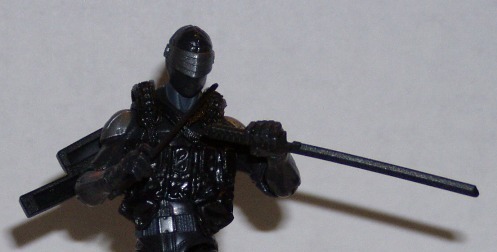 When it came to the Ninja Showdown set, the Snake Eyes of the set fell into the second category. However, much like Agent Mouse, the Ninja Showdown Snake Eyes really surprised me. It was a far better figure than I anticipated, so I have to say, they did a good job with him. 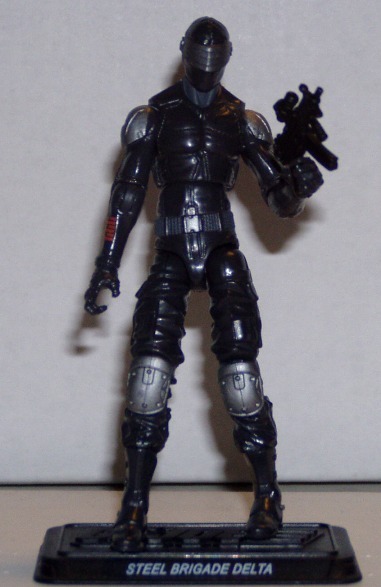 While I would not have guessed it, the Ninja Showdown Snake Eyes shares his entire mold with the first single release Retaliation Snake Eyes. That blew my mind when I was checking out YoJoe to figure out where his parts came from. I’ve passed on the first Retaliation Snake Eyes quite a few times on the pegs. It’s amazing what a slightly different paint job and a new vest can do. 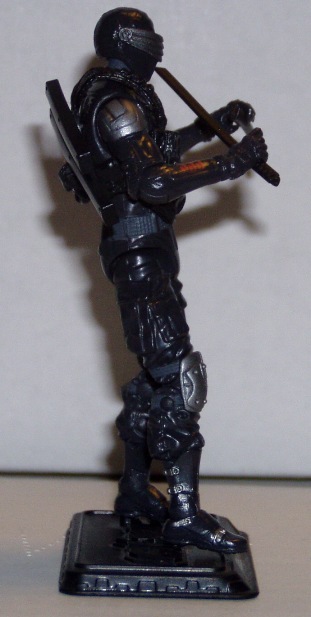 Looking at in more in depth, the Retaliation Snake Eyes mold is quite nice. The details are impressive, from the stitching on his chest to the appropriately baggy yet functional pants. The shoulder armor looks very good and I do like seeing that all his articulation is intact. 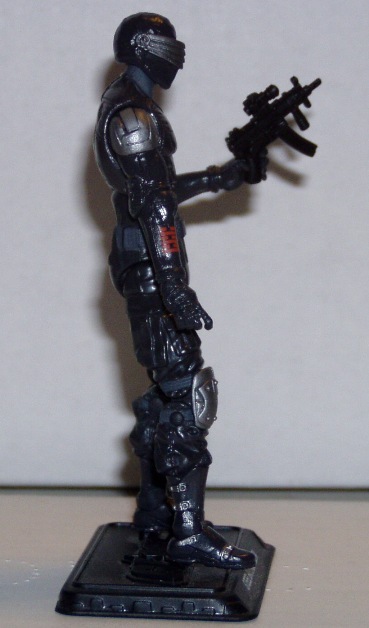 While some of the figures from the early part of the Retaliation line suffered some cutbacks, they didn’t seem to skimp on the articulation for the ninjas, so Snake Eyes is in pretty goodshape. Adding in the new vest, however, makes a figure that I have passed by many times on the pegs and turned it into something I really enjoy. The vest is loaded with pockets and pouches and what I really like is that it reminds me of the look Snake Eyes had in the short-lived DDP G.I. Joe: Reloaded series. This was an entirely different continuity where Snake Eyes was a little more of an unknown factor in the war against Cobra. In fact it’s implied he worked with Cobra for a while only to have turned traitor on them at some point. The head sculpt also shares some parallels with the Reloaded look. I really enjoyed reading a slightly different Joe continuity back in the day and the fact that this figure pays homage to a part of Joe history I very much enjoyed but wasn’t all that popular with everyone else makes me smile. Someone else on the design team must have liked the Reloaded look enough to make a Snake Eyes that looks like it. The head also looks like the really great Snake Eyes from the final wave of Valor Vs Venom…another underappreciated part of Joe history that I really loved since it got me back into the brand when I was a teenager. It’s kind of shocking to me how much of a difference the paint job also makes for this figure. 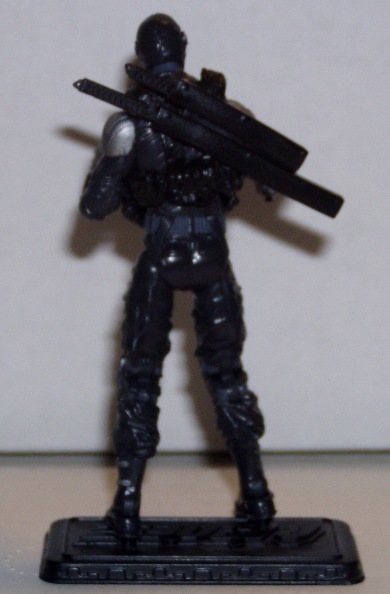 The single-pack Snake Eyes uses a slightly darker color scheme and I think it kind of suffers from that a little. It just looks like a large dark hunk of plastic. However, the Ninja Showdown version picks up some paint apps and slightly lighter colors that really help him out. 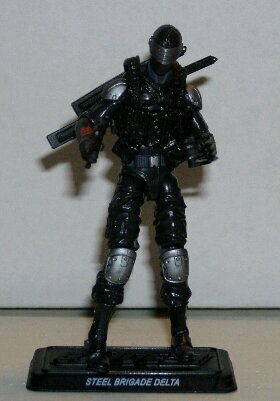 Where the single-pack was a dark gray, I’d say that this version of Snake Eyes comes off a little more charcoal gray. It’s still a dark gray, but it’s not quite as dark as what the single-pack release had. What I really love, though, are the silver paint apps. His visor, shoulder armor and kneepads are all silver, instead of black. I think that really helps lighten up the figure. Even if they’re the same base color, the silver makes him feel just a little brighter and I like that. It adds some much-needed visual contrast to what was initially just another Snake Eyes figure wearing his trademark black-on-black gear. The Arashikage tattoo on his right arm is nice and crisp and looks very good against the charcoal gray base color. Gear in three-packs can be a bit hard to disperse sometimes, so this is what I’ve got him equipped with. Your mileage may vary. YoJoe lists everything I’ve given him as his accessories but the claw, but I think it fits best on his arm, so that’s why it’s there. I’ll start with the piece I’ve already mentioned, the claw. I think my brain was warped by the 1988 Storm Shadow being my first Joe ninja, but man, I love it when figures come equipped with claws. I just like the idea of a stealth operative sneaking up on someone and taking them down with the swipe of a claw. Is it the most effective way to take out someone? Probably not…but remember, ninjas score double points for style. 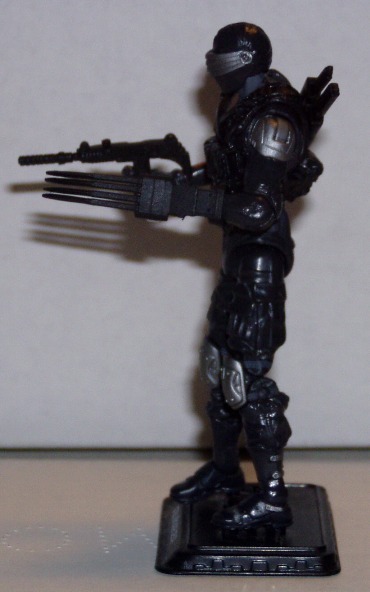 Plus, there’s a little part of my brain that likes the symmetry between Wolverine and Snake Eyes. 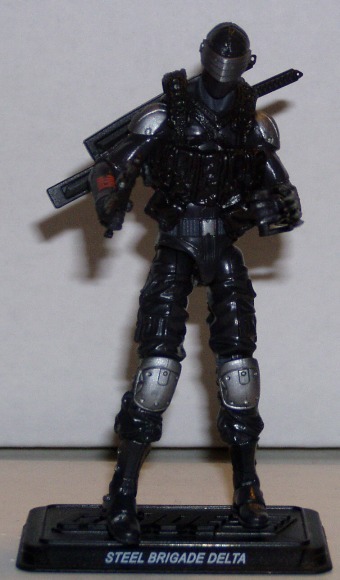 Both characters were really fleshed out by Larry Hama and a lot of fans complain that Snake Eyes shows up too often, just like most Marvel action figure collectors have the same complaint about all the Wolverines in just about every Marvel-based toyline. Snake Eyes wouldn’t be Snake Eyes without a pair of swords and I really like these redesigned swords. The shorter one looks a lot like the Gerber tactical machete that my father owns. Don’t ask me why he owns a tactical machete, but he does and the grips and overall design of the swords a very similar. Snake Eyes looks great with old school ninja swords, but I really like the idea of him adapting his swords to modern technology as well. My only real complaint is that the fit for his swords isn’t that great in his hands. There’s a reason he spends most of his time on the shelf armed with a gun and his claw. The Uzi and silencer is a great throwback to the original Snake Eyes. 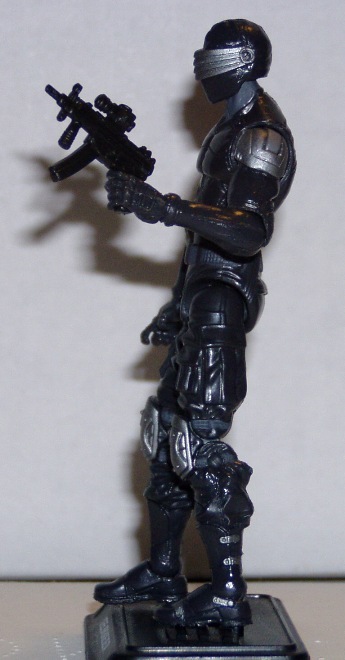 I like that they were able to include a great reference to the classic Snake Eyes on a very modern figure. Additionally, he comes with a second submachine gun that the Pursuit of Cobra Shock Trooper originally had. It’s not a bad piece, but given the choice between a more modern SMG or the classic Snake Eyes Uzi, I’ll go Uzi all the way. All in all, this figure was a double surprise. First of all, it was a lot better figure than I anticipated it would be. For what I thought was going to be “just another Snake Eyes”, it really did do a great job of being the man in black himself. Add in that the vest looked a lot like the Reloaded Snake Eyes and I’m all smiles. 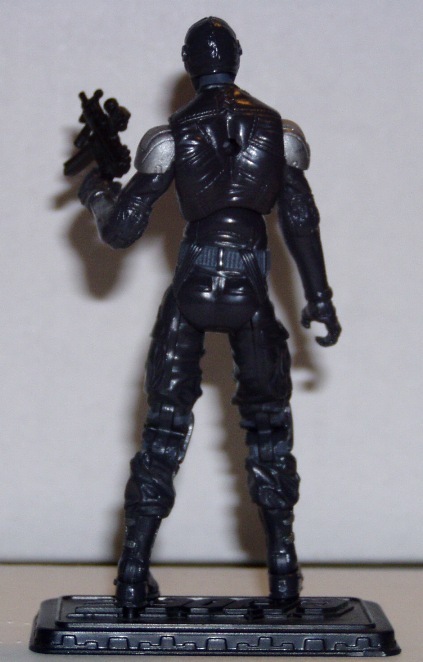 Secondly, it made me re-evaluate my opinion of the first Retaliation Snake Eyes figure. I was rather underwhelmed with most of the Wave 1 offerings, Snake Eyes included. However, learning that this good Snake Eyes shares the same mold as a Snake Eyes I wrote off as lame was kind of an eye-opener. The detailing on that Wave 1 Snake Eyes was really good, it just suffered from a weak paint job that didn’t allow you to appreciate it at first glance and some accessories that were definitely far more kid-friendly than adult-oriented. Getting this figure in a three-pack was a nice surprise. I know I was probably a little unfair in my evaluation of the Wave 1 Snake Eyes just because all his gear was stuff that I wasn’t going to use, but I’m glad that mold has entered my collection in what I consider a better-equipped form. I heard Larry Hamma on the podcast the otherday say he once saw someone with an Arishakage tatoo that was upside down. How would you know which way it was supposed to be. Isnt it symetrical? The hexagram is supposed to be read from top to bottom. This one (the 63rd hexagram) is broken, solid, broken, solid, broken, solid. If it were upside down (solid, broken, solid, broken, solid, broken), it would be the 64th hexagram. 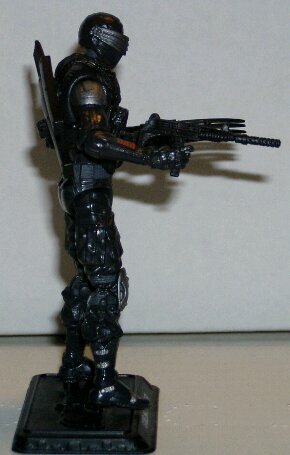 This is a better looking Snake Eyes than the wave 1 version. I agree, it’s amazing what a paint job can do.